I feel kind of bad because at home we don't really have too many "age-appropriate" toys for Caleb to play with. But at gramma's house there were all sorts of toys with buttons and lights and music and talking toys, it was great. 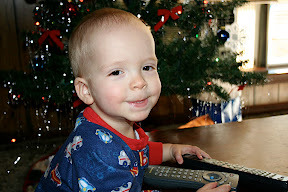 He also discovered remote controls for the tv, which he somehow figured out how to turn on. 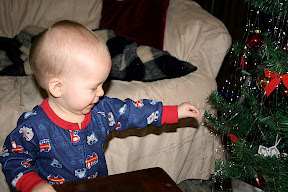 And he just loved the Christmas tree. Gramma would turn on the lights and he would just sit there and stare at it. So lots of fun and excitement at gramma's house.